Lisa lives and works in Olympia, WA with her artist husband and 2 creative kids. She creates visual stories that combine traditional elements of an ancient craft with a contemporary sensibility which is influenced by her own life as well as the folk art of the south- the family's home before moving to Olympia. Primarily self-taught, Lisa has been working with the medium of batik of nearly 20 years, pushing the boundaries of a craft into an art. 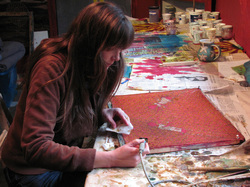 She travels the country exhibiting the work which has garnered many awards.